What are Air Strippers? | Manufacturers of Cooling Towers & Systems | Delta Cooling Towers, Inc.
Home Resources FAQs & Definitions What are Air Strippers? Air stripping technology can be found in many industries and applications. If you work in an industrial field that deals with things like petroleum, dirty groundwater, or harmful contaminants, chances are you have utilized Air Stripping Technology. This equipment is used to clean water in factories, drinking water facilities, waste cleanup sites, and anywhere that contaminated water is found. Air stripping removes chemicals called volatile organic compounds (VOCs), which are chemicals that can evaporate easily by changing from a liquid to a gas. Once the air and chemical vapors are mixed, the vapors are removed or expelled outside if VOC levels are low enough. Modular, pre-assembled and light weight for simple, fast, economical installation. Packed strippers are more economical and effective for larger flows and when large fractional removals are required, especially in the case of waste waters and highly contaminated source water. They operate at a fraction of the pressure drop which reduces the horsepower requirements for air movement in the stripper. In a conventional air stripper, the contaminated water is introduced to the top of a packed bed and the packing is usually a plastic media that is intended to provide a large effective surface area per unit volume for mass transfer. Water flows down the packed bed in opposite direction to ascending air while the air strips the VOC out and exits the top of the stripper. Clean water leaves the bottom of the packed section into a sump. The liquid is carefully distributed at the top of the tower by means of a specially designed liquid distributor. The packing is supported at the bottom of the bed by a support plate that is carefully designed not to constrain the gas flow. In cases where the required packed bed depth exceeds 25 feet, separately supported beds are installed with a collection-redistribution stage between them. Groundwater and Surface Water: Since the principles of Aeration and Mass Transfer don’t change depending on the water source, air strippers can be used to clean both groundwater and surface water that may be contaminated. When used with groundwater this process is typically referred to as a pump-and-treat remediation system. Efficient and Environmentally Friendly: Air stripping solutions are environmentally friendly because they use aeration to force harmful chemicals out of water sources, protecting the user of the water or location the water is discharged back into the environment. Packed-column strippers are the most common type of air strippers. 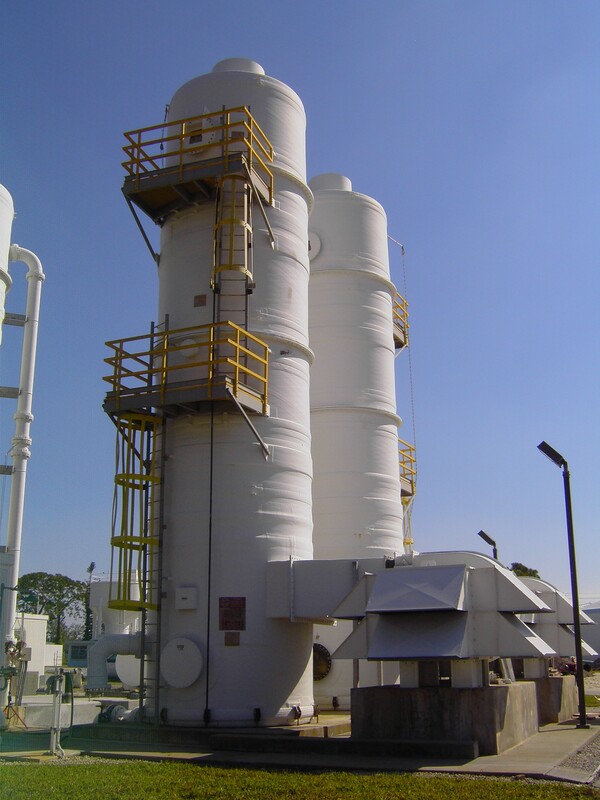 These are cylindrical towers filled with a packing material where water is distributed and exposed to the air. The Delta Advantage: Delta Cooling Towers Inc. offers premier air stripping technology in our patented Vanguard® Air Strippers and Degassifiers. With available sizes up to 15 foot diameter and capacities of up to 4000 GPM per column, these units are some of the most innovative and efficient on the market as displayed by our 600+ installations worldwide. Air stripper installations can be found having a positive effect on almost everyone’s quality of life, be it at the local factory or manufacturing facility or cleaning the drinking water before it flows from the tap at home. To get a quote, visit our easy quote form.